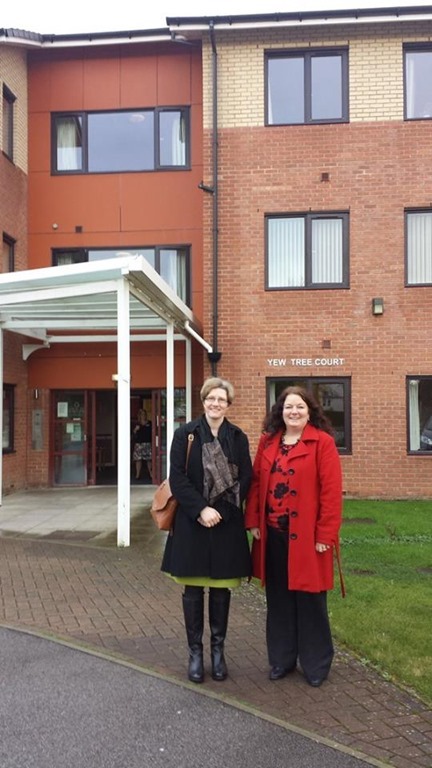 I recently went to have a look at extra care housing to see if it would be a good option for residents in Rothwell, Woodlesford, Oulton and Carlton in the future should they need extra support in their later years. I visited Yew Tree House in Moor Allerton with executive board member and Ardsley and Robin Hood councillor Lisa Mulherin. The visit comes following recent meetings with the council and Dolphin Manor Trust where the council has asked Dolphin Manor Trust to work with it to possibly provide a modern extra care housing with care rather than a traditional care home. Initially we were disappointed that the original plans to have the community trust build a new home weren’t going ahead. I’m still angry about the process and how the decision was made. But it appears that the silver lining is that Rothwell could end up with much better provision for older people. I think It’s great that residents have their own flat within a care setting, I was impressed. It was certainly good to see for myself so I know what it’s all about when we’re discussing future care and housing needs for our older people in Rothwell, Woodlesford, Oulton, Carlton and neighbouring areas. The real test was talking to residents who think it’s great. The big difference that struck me between extra care and a care home is that in a care home residents only have a personal bedroom. In extra care they have a whole apartment with kitchen area and separate living room, and one or two bedrooms within the home. They have every bit as much quality care available as in a traditional care home. There was also an onsite restaurant, hair salon and residents have their own ‘front door’ within the care centre. Plans for an extra care centre could also include a ‘Social Hub’ where refreshments are available for residents and visitors to enjoy at their convenience and the wider community, especially older folk still living in their own homes who might feel lonely sometimes can get involved and socialise in a great modern environment. I think working with Dolphin Manor trust we could create a community hub. We’re keen for Dolphin Manor to stay on board and work with us to achieve this for Rothwell. Working with the trust and providing extra care for Rothwell folk as a social enterprise, we believe will provide the best solution to future local care needs. Now I have seen with my own eyes I’ve seen for myself that it is a better option. I’ve looked at care homes personally for my Dad a few years ago and I know what’s out there. I visited a lot of care homes, at the time if I’d known something like this was available I would have jumped at the chance for my Dad instead of a care home. Extra care is seen by many as the future of care for older people. Many locals I’ve spoken to already, say if they ever needed support, they’d prefer to have their own kitchenette, lounge, bathroom and storage as well as a bedroom. People will be able to keep more of their personal belongings and have somewhere to have their own space when they need it. Visitors will be able to visit and sit in a personal lounge, not either the communal lounge or in a personal bedroom in a care home. The local Liberal Democrats are falsely claiming that the council don’t now want to work with the Dolphin Manor Trust. Nothing could be further from the truth as the council has expressly said that it wants to work with Dolphin Manor Trust but to provide a modern state of the art extra care centre for the people of Rothwell, Woodlesford, Oulton, Carlton and neighbouring areas. Local people will remember the Lib Dems’ record on older folks’ accommodation when they and the Tories were running the council together a few years ago. The Lib Dems closed down popular Holmsley Field House in Woodlesford. The most important thing to me is that the people I represent have the best and that’s what I’ll be working towards. It’s the right thing to do. Hopefully with the Dolphin Manor Trust, as I believe by working together we could create something special for Rothwell. A new care home, Oulton Manor, is being built on the old Bentley Arms site next to Rothwell Sports centre with around 80 beds and the council are also working on plans to provide a nursing home to fill the gap for those in need of the most support. With an extra care housing centre, a new care home and a new nursing home in the pipeline, this will give local people the widest possible range and choice as they find that they or their loved ones require extra support in the Rothwell area. We would like to ask local people what they think of extra care housing plans. Some locals have already told me and commented on our Rothwell News Facebook page that their personal preference if they should ever need a care setting would be for extra care housing with their own space. Please get in touch and tell us what you think by emailing, commenting on here or our Facebook page (just search Rothwell News). This entry was posted in Carlton, Environment, Family, Health, Housing, Leeds City Council, Liberal Democrats, Older People, Oulton, Rothwell, Social Care, Woodlesford by Karen Bruce. Bookmark the permalink. Think the extra care setting sounds like a fab community for older people and their families. So that families can come together In a private space and the older person can spend as much time with friends inside the centre too!! Great idea!